MEGADETH mainman Dave Mustaine was interviewed last week on the Fox Business program "Kennedy", hosted by former MTV VJ Kennedy. You can now watch the segment below. A few excerpts follow (transcribed by BLABBERMOUTH.NET). 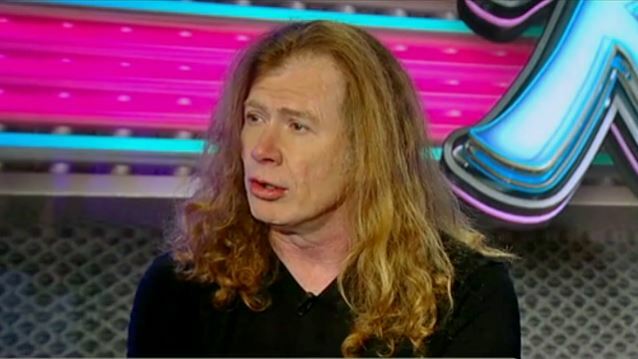 Mustaine: "I don't really follow Bernie Sanders that much, but I do think you're right about that — [that he is] trying to portray things are gonna be utopian if you you over to his direction. But I think that right now it's so hard to look at all the different candidates and try and figure out, what are they really about? I mean, if you peel away the veneer, who are they? It was funny, when [Marco] Rubio had that meltdown and he started to get into the name-calling stuff and you see who he really is capable of being. Or not. Is he really the other guy that was stayed all the time. So… I don't know." Mustaine: "Yeah, I think so. I think that… Well, for me… I mean, we've been friends for a long time, so you know a lot about me. And when we first actually met, we were doing the 'Rock The Vote' thing in '92 for the Democratic National Convention, so I've had a lot of experience covering politics, learning about it in order to do that. And I think that the way that the whole process is right now, it's, like, who do you vote for? This is the lesser of two evils, you know. And you hear all these celebrities that are saying, 'Well, if [Donald] Trump gets elected, I'm moving to…' 'If Hillary [Clinton] gets elected, I'm moving to…' and it's, like, if you don't like the way the political process is going, then do something about it. Get involved. Change it." Mustaine: "None of 'em. 'Close,' if you mean 'close close.' But, you know, it's weird. You have a friendship and then it's broken up and you try and tell yourself…. justify why it happened. And a lot of times, you wanna make the other person look like the bad guy, 'cause you don't wanna really show that you still have emotion about it. And if you didn't care about somebody, they have no capability of hurting your feelings. So I think a lot of that whole feud was buried decades ago — literally. And it's just people keep asking — 'cause they don't know. And I used to get bent out of shape, because when people would ask me the same question… I think the funniest thing is when people try and talk to me and they'll say something like, 'So, what's it like in MET… eh… MEGADETH?'"